The Honor 8 Lite was launched on 11th May, 2017 in India. The smartphone features a slim dual 2.5D unibody with stunning light reflection,12 Layers of glass at the back, brushed steel effect finish and chamfered edges, making it flawlessly smooth. The device features a 12MP camera with 1.25μm pixels, PDAF fast focus with a speed of just 0.3 seconds, bringing a quicker, more accurate shooting experience. The newly added video editing function can help to create your own mini-movies. The BSI CMOS sensor enables to capture moments even in low light conditions. Equipped with chip-level security and isolated encrypted fingerprint templates that cannot be retrieved or recovered, Honor 8 Lite ensures top-level security to protect your private information. The device is available in Black and Blue. The device comes with a 5.2 inches capacitive touchscreen display with a screen resolution of 1080 x 1920 pixels and display type of IPS LCD. The pixel density up to 423 PPI combined with dynamic backlight adjustment and color enhancement technology, provides the most vivid viewing experience. The smartphone makes use of an octa core HiSilicon Kirin 655 that is coupled with Mali-T830 MP2 GPU, 4GB RAM and 64GB default memory capacity. This storage can be expanded up to another 128GB with the help of a microSD card. The device features a 12MP camera with 1.25μm pixels, PDAF fast focus with a speed of just 0.3 seconds, bringing a quicker, more accurate shooting experience. The camera also feature video editing function and multi video recording modes. Up front, the smartphone makes use of an 8MP camera featuring F2.0, 77 degree wide angle lens and all new selfie modes. The connectivity aspects include Wi-Fi 802.11 b/g/n, WiFi Direct, hotspot, v4.1, Type-C 1.0, with A-GPS and dual sim (Nano + Nano). The smartphone has a long-lasting 3000mAh battery with an energy density of 650WHL, a power-saving 16nm chip and Smart Power 5.0 system, which enables multiple power saving modes. This will give you a maximum of 93 hours*4 of use including offline music playback, giving you more time for entertainment between charging. The device runs Android 7.0(Nougat) with EMUI 5.0, out of the box. The Fingerprint sensor present on board unlocks the device in just 0.3 seconds. The sensor ensures top level security to protect private information. The other sensors are Compass/Magnetometer, Proximity, Accelerometer, Ambient Light, Gyroscope, Barometer and Temperature sensor. 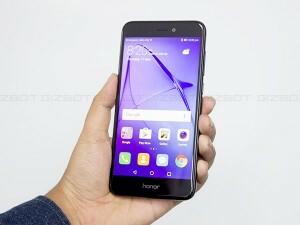 The Honor 8 Lite price in India starts from Rs. 12,990 for 4GB and 64GB variant. New Xiaomi Mi 8 Lite variant spotted on TENNA. The new variant of the Xiaomi Mi 8 Lite packs an upgraded 8GB RAM with red trims all along the sides as well as around the fingerprint scanner. Xiaomi Mi 8 Lite is all set to be released in Taiwan on the country’s Single’s Day, which is November 11. Notably, Xiaomi Mi 8 Lite and Mi 8 Pro were announced by the company in September.